A powerful tool for your ford, but with a large price tag. Connects to your PC or tablet, meaning the interface is intuitive and familiar. Does not have a screen, so has no disadvantages which come with that. A solid device. 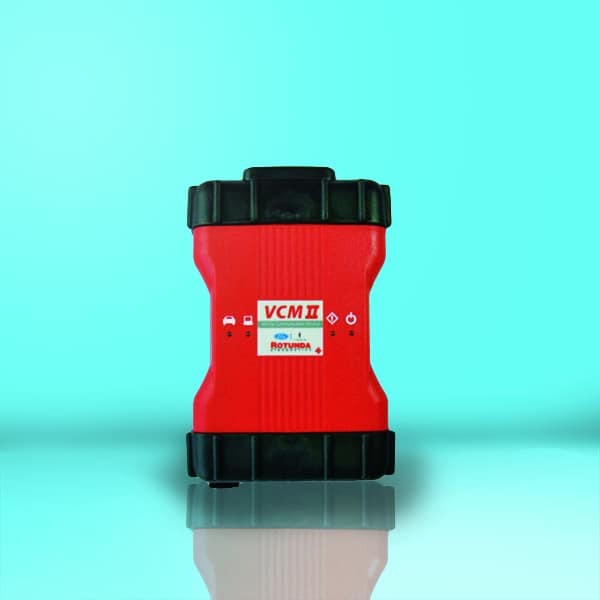 This review of the Ford VCM 2 scanner gives you all the information you need to make an informed choice on car scanner. There is a lot of scanner advertising out there, but we have taken the key features and functions so that you get all of the relevant information without the disinformation; we cover the important points and get rid of the fluff. By the time you get to our summary, you will know if this product is right for you. This is a powerful tool but uses a familiar interface to welcome new and experienced users. 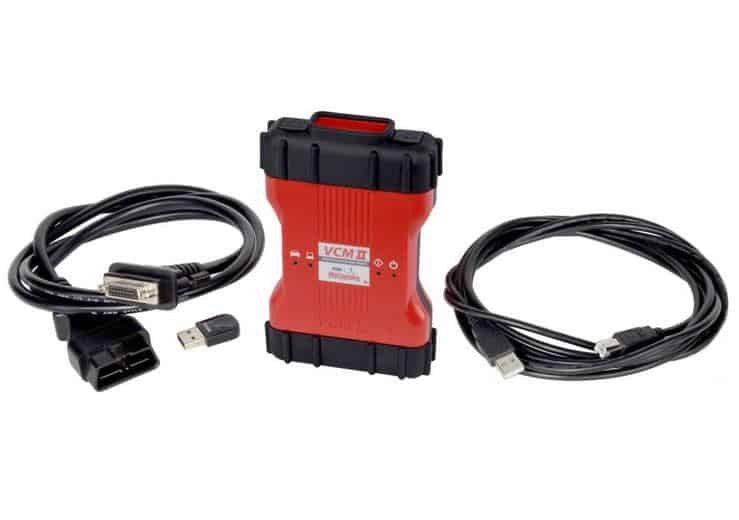 The functionality of the tool means that it can be used by almost anyone, and the connection with your PC or smart device means that you have a familiar interface with which to scan your vehicle. You can read and reset codes with this device, but the real power comes from the display. By having the data on your laptop or tablet, you can have a lot of information on display at one time, helping you to efficiently diagnose problems with the vehicle. This scanner is only useful for owners of Ford, Lincoln, or Mercury vehicles. If you do not have one of those vehicles, then this product is going to be useless to you. The fact that you can connect this to your home computer or smart device means that it is accessible to anyone. You have more chance of the controls being user-friendly and intuitive if you are using the software on your own device. The main stumbling block for individuals is the price. This is a powerful and expensive tool. Unless you have a lot of money lying around, you are not going to be able to afford this for use on a single vehicle. This product is geared towards professionals. You can easily scan vehicles and move quickly between them, controlling the scan from a separate location. If you are a mechanic who works on a lot of Fords, Lincolns, and Mercuries, this scanner will help you diagnose those vehicles, save you time, and save you money. Out of the box, you have the scanner itself, a detailed instruction manual which has everything you need to get your scanner up and running, wireless USB cards, a DLC cable, a VCM to laptop cable, and a customer flight recorder kit. The relevant software is loaded onto the device, but you will need to download and install the software on your laptop or smart device. This is one of the newest tools on the market for diagnosing Fords. With the integrated IDS software, you get dealer-level diagnostics. One thing we like is how committed Ford is to updates. The diagnostic interface is brand new and had been redesigned for user satisfaction. You also have access to regular updates, so your diagnostic tools stay up to date, and the interface is current. When you compare this scanner to other Ford scanners, it is easy to see how much more power and functionality you get with this device. We love how easy it is to communicate with your smart device. You can communicate with your laptop or tablet without having to download any additional software. Most wireless connections require you to download additional software; this means that multiple technicians can work on the same vehicle and device without having to do anything extra. This scanner is backward compatible for all Fords built before 2013 and is future-proof. All new Fords will be VCM II, and this device will support that. It also supports the Vehicle Measurement Module and Customer Flight records. One thing which makes this device suitable for a shop environment is how well-built the device is. The casing is durable and protects the components within from impacts and shocks. There are also shock-resistant ends to protect from any electrics; this is essential in a shop environment. When you connect this device, you will be presented with automatic vehicle recognition, allowing you to get to the diagnostics quicker without having to traverse through many menus. When you scan your vehicle, the scan will be completed quickly. When we measured this device against others on the market, it was one of the quickest at diagnosing a vehicle. Once you scan your vehicle, you can read and clear multiple codes. Along with this, you have guided fault-finding. With most scanners, you get the code, and you are done. With this scanner, you get some help to get to the route of the problem, letting you fix the problem quicker and make more money for your business. The live data stream also helps you effectively diagnose any problems with your vehicle, and you can record this live stream for playback at a later time. This recording ability allows you to share this data with others and get a second opinion, or save the date until you have time to go through it fully. You can use the scanner to program and install new PCM, ABS, instrument clusters, airbags, fuel pumps, and more. You can also program new keys with this device. Coding is a powerful function, and the ability to program the injector is a big benefit. We also like that you can adjust and remove the speed governors. Add to this the ability to reset the steering angle, bleed the brakes, and take advantage of other dealer functions, and you have a powerful device at your fingertips. This scanner is a professional device. It benefits from having the functionality of a standalone device and a powerful data interpreter through Bluetooth and an app. By having the option to switch between one and the other, you really have two devices at your disposal. It works very well in a professional environment and can easily be shared between colleagues to effectively diagnose multiple vehicles at the same time. The standalone nature of the device means that you do not have to use a powerful device and data analysis with simple problems, but that power is there when you need it. The device is also handy for individuals who want to be able to fix their vehicle by themselves. The software will help you to effectively diagnose and fix your vehicle (even though you will need to pay for it at some point). Great for everyone.